You can rely on this stunning chicken sandwich to impress your lunch guests. 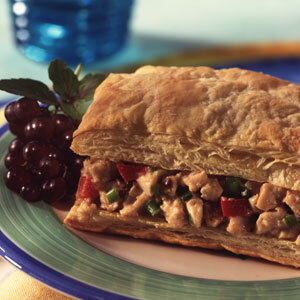 It features thin layers of puff pastry, filled with a honey-mustard chicken pecan salad. Sprinkle the work surface with the flour. Unfold the pastry on the floured surface. Cut the pastry into 3 strips along the fold marks. Cut each strip into 2 rectangles, making 6 rectangles in all. Place the pastries on a baking sheet. Bake for 15 minutes or until the pastries are golden brown. Let the pastries cool on a wire rack. Stir the chicken, pecans, onions, pepper, if desired and dressing in a medium bowl. Split each pastry into 2 layers, making 12 layers in all. Divide the chicken mixture evenly among 6 bottom layers and top with the top layers.